I never make any secret about how much I love fall at Augustana. From freshman move-in day, to the first day of classes, to the smell of autumn in the air, the energy, excitement and anticipation for the year ahead are truly palpable. On a college campus, fall represents the chance for us to once again, as the great Ralph Waldo Emerson so wisely once said, "Hitch our wagons to stars." For our students, fall is a chance to start fresh with new classes, new professors, new roommates and new goals. Fall brings with it the optimism, curiosity and willingness that always seem present at the start of a journey. And really, that’s how it should be. For this journey, we believe, is among life’s most important endeavors. The four years our students spend here will lead them to who they will become in life. For our faculty and staff, fall brings with it another chance to help our students explore and discover important ideas today so they may go on to create a better world tomorrow by championing justice, love, freedom, knowledge and utility. At Augustana, we realize that the lessons we pass on to students extend far beyond those they receive in our classrooms and labs. These are the impromptu lessons that happen in the hallways of our residence halls, on the pathways that criss-cross through campus, and at dining room tables. These are the discussions that help teach our students the value of trusted counsel during times of trial; the importance of listening to the other point of view; the power of understanding; the art of compromise; and the sense of calm that comes from forgiveness. Here, our students are part of the College community, which means we think of them like family. We care about their interests and passions, we celebrate their successes, and we work with them through challenges. 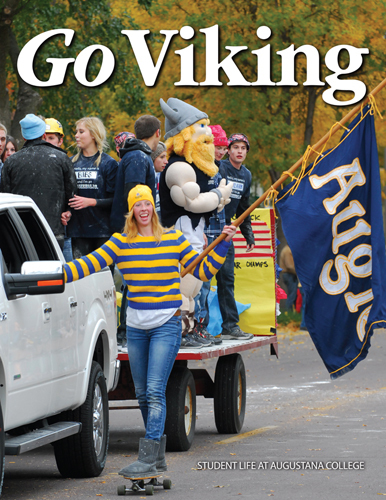 This sense of community is, I believe, what sets Augustana apart from other colleges and universities nationwide. We consider ourselves far more than just faculty and staff members – we believe we are called to serve as mentors to our students. Since her founding in 1860, Augustana has been blessed by many extraordinary mentors – men and women committed to passing on knowledge and skills, fostering faith and encouraging exploration and discovery in generations of young people who have gone on to serve the world in various capacities. In addition to Augustana’s strong teacher-scholar mentors of past and present, we are grateful to our supportive alumni who, through their commitments to "pay it forward," have created nearly 600 endowed and annual scholarships for the students of today. These awards are presented to Augustana students each year based on primarily academic merit and financial need. It makes me proud to say that throughout our history, Augustana has remained a strong proponent of social mobility and works hard to create opportunities for students from all economic backgrounds to achieve their dreams of higher education. Nearly 95 percent of our students received institutional aid last year – financial aid gifted by the College that does not require repayment. Nearly 70 percent of Augustana students show financial need and nearly 30 percent show high financial need (PELL-Grant eligible). Here, we are committed to doing all we can to ensure that students who want an Augustana education get it. It’s why the average financial aid award (including scholarships, grants, loans and campus employment) for members of Augustana’s class of 2016 was $25,327. I’m hopeful that you’ll make plans to visit campus soon to learn how Augustana can help you "hitch your wagon to a star" and begin the journey to achieving your dreams. During your time here, you’ll be able to tour the campus and its facilities, meet with professors, talk with current students, and visit with admission counselors. We’re looking forward to talking with you and your family soon!